What's green tea theanine? How does its natural form compared to its synthetic manufactured cousin, found in supplements? If you are new to gourmet tea, you probably haven't heard much about theanine. Much of green tea's antioxidant benefit comes from its famous components, catechins, of which the most abundant and potent is EGCG. Tea lovers drink tea because of its soothing properties and unique taste, which correlate strongly with the level of theanine. It is probably the most valuable tea constituent, as experts have known that the theanine in green tea is the single most important marker of quality. Ever wonder why high grade green tea, which contains the highest level of caffeine, is more soothing to drink than lower grade tea? The answer is theanine. Scientific studies performed using electroencephalography discovered that theanine decaffeinates tea naturally. If about 8 times as much of theanine is given than caffeine, the effects of caffeine is completely blunted. 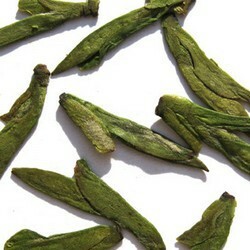 Theanine is present in the highest concentration in young tea buds. As leaves mature, it gets converted into catechins. This means high grade green tea, which tends to be made from young tea buds, contains more theanine than that made from mature leaves. According to credible sources, an average green tea sold in the West contains only 10 milligrams of theanine per cup, whereas a high grade bought in China or Japan will contain 5 times as much. Scientific studies have shown that you need at least 50 milligrams to have a beneficial impact. This leads to the question: Why bother with the expensive natural theanine when one can buy synthetic theanine cheaply? Very safe and suitable for long term consumption. Effective for treating anxiety and sleeping disorders. Does not contain caffeine, which may cause problems for people with medical conditions. Young tea buds also contain the highest concentration of EGCG, which explains most of green tea's proven health benefits. Combination of EGCG, caffeine and theanine, in addition to many other undiscovered tea compounds, result in synergy i.e. the sum is greater than the parts. A 2007 study found that theanine and caffeine synergise to increase your brain's ability to concentrate. And finally, how can a real tea lover say no to a soothing cup of high grade green tea? They are both good. The choice is yours. Imagine you are sipping the best green tea in the world. Despite being a long time drinker of green tea, you are completely blown away. Never have you tasted something so fresh and full bodied, lightly floral and yet flavorful. No matter what water temperature you use, the tea is always sweet and never bitter. 2-3 glasses mid morning leave you completely relaxed and energized for the day. Your palate feels very clean, silky and refreshed all day long. Your mind feels calm and concentrates very well with whatever task at hand. This tea is called Tribute Dragon Well Tea. It is grown in the Lion Peak Mountain of Hangzhou, China. The Chinese White House - Zhong Nan Hai - sources 500 kilograms this tea yearly. You can now buy this tea from this site at 100% purity. Launched in 2006, she has accumulated nearly 170 raving reviews. Customers are saying that this is the best green tea they have ever had! Desai MY, Armstrong DW (2004). Analysis of derivatized and underivatized theanine enantiomers by high-performance liquid chromatography/attmospheric pressure ionization-masss spectrometry. Rapid Commun Mass Spectron. 2004; 18(3): 251-6. Kakuda T, Nozawa A, Unno T, Okamura N, Okai O (2000). Inhibition effects of theanine on caffeine stimulation evaluated by EEG in the rat. Biosci Biotechnol Biochem. 2000 Feb; 64(2): 287-93.